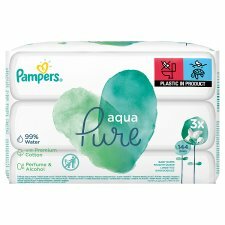 Pampers Aqua Pure Wipes – made with 99% pure water and a touch of organic cotton – help to protect your baby’s precious skin. They do not contain alcohol or perfume. The remaining 1% of ingredients is made up of dermatologically-tested gentle cleansers and Pampers proven pH buffering ingredients, to help maintain the pH balance of your baby’s skin and protect from skin irritation. Aqua Pure wipes are safe for newborn skin— including bottoms, hands, and delicate faces. Please dispose of wipes in the bin - do not flush wipes.